Planning a visit to Adam’s Taphouse and Grille in Prince Frederick? What a great choice! Whether you’re a first-timer or a frequent customer, we want to make it easy for you the next time you order. Here are 7 must-try menu items that are sure to delight your taste buds. There’s nothing quite like biting into a meaty stack of ribs. At Adam’s, we couldn’t agree more. That’s why we offer tender, BBQ’d Baby Back Ribs every day of the week. The meat falls right off the bone. Don’t believe us? Come in and try it for yourself. While you’re here, order a platter. They also come with French fries and coleslaw for a hearty meal. Soon, you’ll understand why Adam’s truly is the place for ribs. Cooked slowly to perfection, our BBQ’d Chicken is a tender, savory dish. It’s one of our favorite must-try menu items. Coupled with lip-smacking-good BBQ sauce, our chicken is truly a force to be reckoned with. Can’t decide between the BBQ’d ribs and the BBQ’d chicken? Get both with the Ribs & Chicken Combo Platter. If you can’t get enough BBQ, try the Pulled Pork BBQ. Our braised pork is pulled right from the bone. As a result, it’s very tender and moist. And, after being plucked from the bone, the pork is chopped and piled high for a delectable sandwich. Choose from Adam’s BBQ sauce or North Carolina pig pickin’ sauce, and dig in. 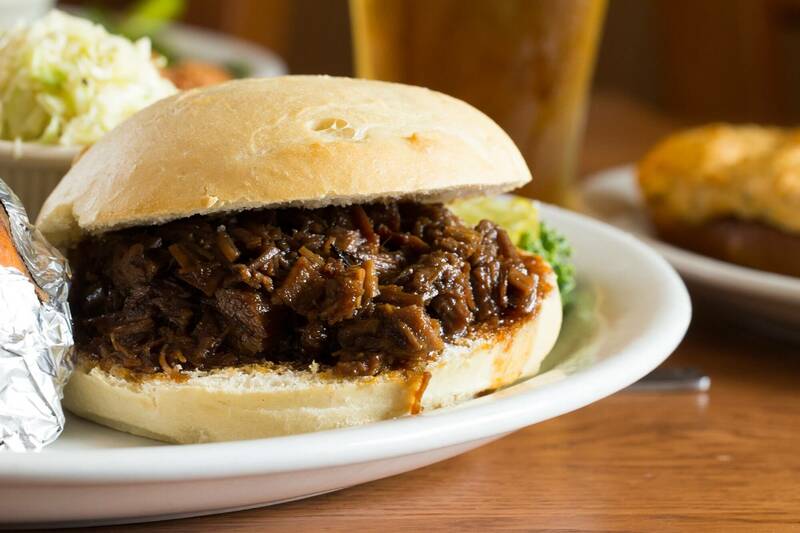 Get your hands dirty with our Chopped BBQ Beef Brisket. Topped with either Adam’s own BBQ sauce or Adam’s Bourbon sauce, this tender braised beef brisket is simply divine. Not to mention, it comes with French fries and coleslaw. Overall, you just can’t go wrong with ordering this flavor-packed sandwich. Bacon mania is still going strong at Adam’s. That means you’re in for a real treat. To create our delicious BBQ Scallops, we first wrap them in bacon. Then, we fry them to perfection. Finally, these mollusks are topped with Adam’s traditional BBQ sauce. Enjoy them as an appetizer, or have them as a meal. If you love bacon as much as we do, you just have to try this seafood dish. We take large shrimp, wrap them in bacon and slather them with Adam’s own BBQ sauce. Then, we toss them on the grill until they’re nice and smoky. 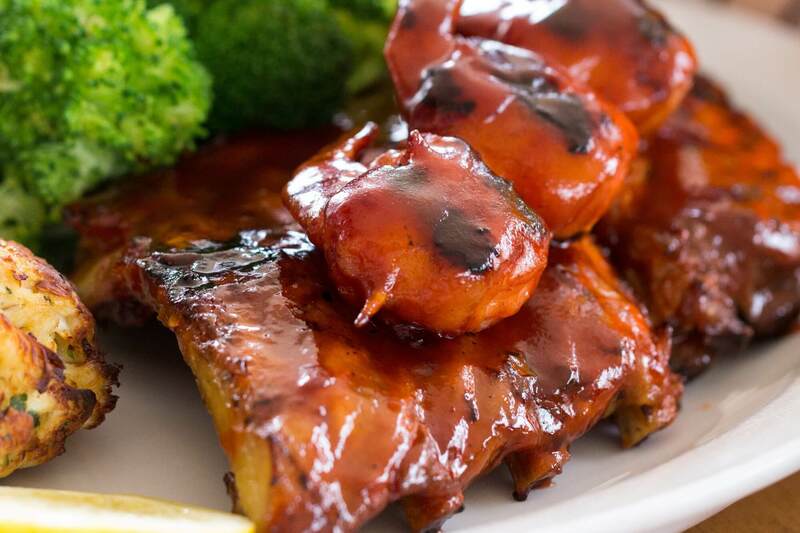 You can even get our BBQ Shrimp as a combo with either ribs or chicken. At Adam’s, we’re not just about BBQ anymore, although that’s what we’re famous for. 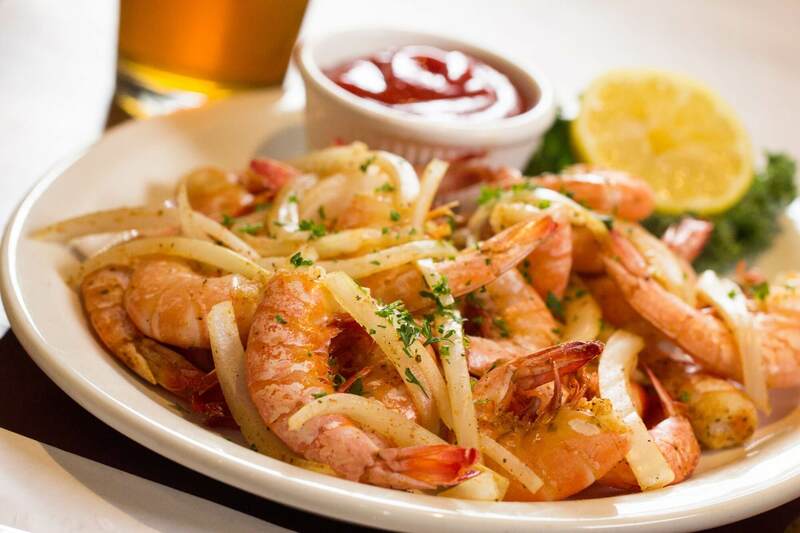 Today, you can find everything from shrimp scampi to hearty burgers gracing our menu. If you’re craving a change of pace, may we recommend the Adam’s House Sirloin? This 10 oz. choice cut sirloin steak is cut right here and chargrilled based on your unique specifications. That means it’s always cooked just the way you like it. We know you’re already drooling, but hang tight – you still have to get here. Whether you’re a Calvert County resident or visiting Prince Frederick, a stop at Adam’s Grille should be at the top of your to-do list. Come in and check out our must-try menu items today.